A new collaboration between UTS, the Commonwealth Bank (CBA) and its customer Stockland, will enhance opportunities for our students to explore social robotics in a wide range of applications from adding value to the bank’s customers and assistance to shopping centre visitors. “Social robotics is an emerging field that studies the design and impact of robots interacting with people in public spaces, workplaces and our homes. Robots can solve problems and complete complex tasks; but social robots are not just problem solvers, they have emotional and social intelligence that allows them to collaborate with people in safe, fluent and enjoyable ways,” says Professor Mary-Anne Williams, Director of the UTS Innovation and Research Laboratory aka The Magic Lab. The Magic Lab is Australia’s preeminent centre for social robotics research and makes UTS an attractive partner for CBA – the largest listed company on the Australian Stock Exchange – which invited us to work alongside its staff in the CBA Innovation Lab, a leading-edge national space developing new customer products and tools. The collaboration also includes one of CBA’s major customers, Stockland, the largest diversified property group in Australia. It has a huge and varied customer base and wants to develop and deliver innovative practices and services using new and disruptive technologies. A team of 12 UTS staff, PhD students, honours students and undergraduate students are embedded within the CBA Innovation Lab, designing experiments to explore social robotics. Experiments will include CHIP, a humanoid robot designed by Spanish company PAL Robotics, one of just three worldwide and the only one in the Southern Hemisphere. CHIP is 1.7m tall and can interact with people and provide a variety of information and services through a torso touchscreen. CHIP recognises faces, talks, answers questions, can grasp and move objects and move around independently just like a person. “UTS’ capability in Human-Robot Interaction is already well-established with our social robot GUTSY, Australia’s only PR2. We are part of a social robotics ‘eco-system’ which includes top universities such as MIT, Stanford University, UC Berkeley and the University Tokyo, the leading University in the Asia-Pacific region,” says Professor Williams. Over the next two years UTS students will be at the coalface working with our corporate partners running robot/human experiments designed to discover the impact of robots in human settings, and developing increasingly sophisticated social robot technologies as collect key insights and we learn more. “Together we are designing experiments and our students are very creative - this is the future, and we are imagining it! We don’t know yet what we will find – no one knows yet! We don’t have any answers – just lots of questions to explore at this stage. We will run a range of human/robot interaction experiments that will provide critical insights for our algorithms to enable enjoyable and safe interactions. In addition, we will help people learn how to work with robots to achieve complex objectives,” says Professor Williams. Robots can augment people’s abilities, leading to a whole new world of employment in areas of business operations with higher levels of transactional competency, and more jobs created using the data extracted. “Today people are better at dealing with complexity in changing and uncertain situations – and robots are better than people at solving highly structured problems, directly connecting to other technologies, and finding interesting patterns in big data,” says Professor Williams. CBA/Stockland working with UTS represents a unique collaboration between academe and industry on exploring the impact of artificial intelligence as a disruptive technology, and an example of the much –needed collaborations outlined in ‘Working Together’ in the National Innovation and Science Agenda, delivered in 2015. “Australian industry is well placed to take a global leadership position applying robot technologies to create new value and to disrupt existing value pools. UTS wants to work with industry partners to build the pipe line of talent, skills and capabilities required to make that a reality,” says Professor Williams. 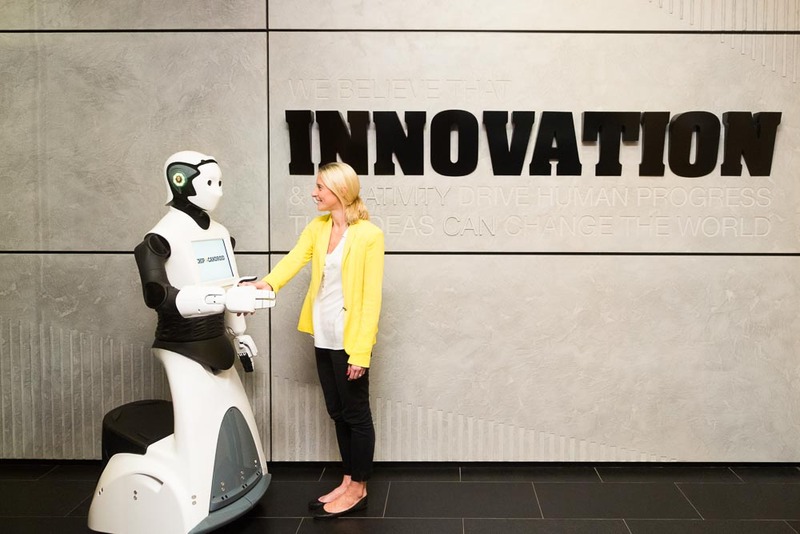 · Stockland to consider how disruptive technologies can be introduced in its business parks, logistics and shopping centres, and residential and retirement living communities. © Copyright UTS - CRICOS Provider No: 00099F - 17 October 2016 02:30 PM. The page is authorised by Deputy Vice-Chancellor and Vice-President (Corporate Services).